The Kempinski Grand Hotel des Bains St. Moritz is a sophisticated hotel that enchants guests with a genuine and yet exceptional concept – a Grand Hotel with savoir-vivre. It is a designer hotel for some, while for others it possesses the magical qualities that come from a unique combination of old yet new. Designed on a grand scale, yet possessing a special elegance, its stellar qualities co-exist in pleasing harmony. The hotel, located in a quiet location surrounded by trees and a host of sports activities, appears like a fairytale castle with its sweeping vistas of the surrounding mountains. It impresses with its exclusive and stylishly elegant guestrooms and suites. This classic design, accompanied by historical motifs that bear witness to the long history of the town of St. Moritz, is skillfully combined with modern luxury. 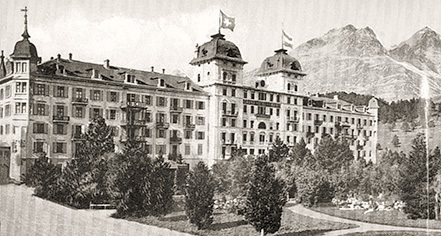 The Kempinski Grand Hotel des Bains is steeped in tradition and can look back on an illustrious past: the hotel was originally built in 1864 as the Grand Hotel des Bains. The destination originally became famous for its mineral spring, discovered some 3,000 years ago. At the beginning of the 19th century, high society from all over Europe took the voyage to St. Moritz to enjoy the healing properties of the spring. Hotel guests can access the spring via a fountain, located in the spa area of the hotel. The first renovations of the building took place in 1887, aimed at giving the edifice the appearance of a sleek, northern Mediterranean palace. In 1906, the corner towers were enlarged. 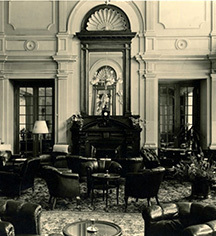 In 1927, further building was done, bringing about the Ca d’ Oro, the hotel’s Michelin Star accredited gourmet restaurant, as well as portions of the lounge and entrance area. The last renovations began in October 2001, when the facade and interiors were completely renovated and modernized, with great emphasis placed on restoring the palace-style structure to its original elegance.